Resource Center Can Marijuana Be Abused? Marijuana is a drug made from the dried leaves or chemical extract of the cannabis plant. The primary chemical substance sought after in this plant is delta-9-tetrahydrocannabinol, commonly known as THC. This chemical produces the euphoria, or “high,” as well as the other psychoactive experiences, people seek when they smoke marijuana. Some of these psychoactive properties include mood changes, paranoia, and hallucinations, depending on the strain. Can Weed and Other Hallucinogens Cause Depersonalization? Marijuana: What Happens during a Body High? Should You Quit Weed Cold Turkey? What Are the Effects? Spending Money on Weed: How Much Is Too Much? What Are the Symptoms of Being High on Marijuana? There are over 100 chemicals in marijuana, called cannabinoids. One of these is cannabidiol (CBD), which is suspected to be a pain reliever and relaxer. This chemical is the main focus of medical marijuana research in other countries. In the US, researchers cannot investigate the potential medicinal properties of marijuana for now, because it is still a Schedule I substance per the Drug Enforcement Agency. Although it is tightly regulated at the federal level, the United States Department of Justice announced in 2014 that it would not prosecute businesses regulated by states that had passed marijuana legislation, either for medical or recreational reasons. Marijuana has become incredibly popular in the last several years, and about half of all adults in the US admit to trying this drug at some point in their lives. Marijuana is especially popular among teenagers and young adults, as 61 percent of children under the age of 15 have tried marijuana in some form, according to a 2009 study. A 2015 Pew Research study found that 69 percent of individuals believed that alcohol was more damaging than marijuana, and 53 percent believe that marijuana should be legalized. However, marijuana is still a drug, and people can become addicted to it. Addiction is a disease involving compulsive behavior that escalates over time, particularly around substances, but also sometimes around behaviors. While individuals who chronically abuse marijuana may suffer mild physiological withdrawal symptoms when going without the drug, these symptoms are not physical in nature or as severe as the withdrawal symptoms associated with other drugs, like prescription painkillers or alcohol. Still, many people are unable to stop using marijuana without professional help, and that constitutes addiction. About 22.2 million people in the United States used marijuana in the past month, according to a 2014 survey reported on by the National Institute on Drug Abuse (NIDA). As the most widely used and abused illegal drug in the country, a good portion of people have tried it at least once. About half of people who try the drug will find use of it becomes habit-forming at some point in their lives. Among people who use marijuana, about 9 percent will become addicted to the drug, per NIDA. While this addiction rate is lower than that associated with other drugs like heroin, alcohol, or amphetamines, it is still a statistically significant portion of people who use marijuana. While marijuana is often viewed publicly as a benign drug, there are various effects that come with long-term use. 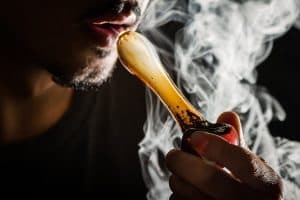 People who become addicted to marijuana are at higher risk of poor judgment, as well, which puts them at greater risk of catching a sexually transmitted infection, committing other crimes, becoming addicted to other drugs, or having an unplanned pregnancy. In young people, risks can significantly reduce quality of life and harm future potential. About half the people who enter treatment for marijuana use disorders are under the age of 25. Although the DEA still considers marijuana a Schedule I substance and it is illegal at the federal level, the DOJ stated that the drug would be decriminalized as states have legislated the drug’s use in various forms. As of 2016, 23 states and the District of Columbia have legalized marijuana in some form. Four of those states have legalized recreational marijuana use: Alaska, Colorado, Oregon, and Washington. While medical research is being conducted on the potential beneficial properties of marijuana in other countries, the effects of recreational use are poorly understood at this time. However, recreational marijuana strains are becoming more potent than ever, meaning users can get more of a high from using marijuana than those in previous generations did. This may increase potential addiction risk for users, but little research has been conducted on this. The primary reason that many states are legalizing marijuana is because of alleged health benefits for people who suffer chronic pain diseases like arthritis or multiple sclerosis, as well as for people who have terminal illnesses like cancer. Advocates of such use say that marijuana relieves pain and anxiety, and improves appetite – a combination that prescription painkillers do not accomplish. Marijuana can also reportedly help epilepsy by reducing seizures, might reduce psychological problems associated with traumatic brain injury, and may even stave off some mental health problems related to Alzheimer’s disease. Medical marijuana and recreational marijuana are different strains of the same plant. Recreational users focus on achieving a high through THC, while medical marijuana is bred for a higher CBD content and lower THC content. Although this has not been scientifically proven, people who grow, regulate, and use medical marijuana believe that CBD is the cannabinoid that relieves pain, sooths the mind, and can relieve nausea. While both CDB and THC are present in all strains of marijuana, breeders aim for higher concentrations of one over the other depending on the desired outcome. To prevent any potential for addiction to medical marijuana, many states are “CBD only,” meaning that only cannabidiol oil or extract can be used medically. This is extract of just the CBD chemical, so the user will not be ingesting any THC. Other states regulate the THC content in the plants, but do allow people with medical marijuana prescriptions to use the plant or products of the plant. It is possible that people could become addicted to marijuana through a prescription. Two new FDA-approved drugs, dronabinol and nabilone, have THC in them, and they are prescribed to treat nausea and improve appetite. A side effect of these medications might be addiction. While these medications are new to the market, it will be important for medical researchers to watch for potential signs of addiction to these THC-based substances. Currently, these medications are prescribed in low doses to individuals undergoing cancer treatment or HIV treatment, or suffering from extreme weight loss due to side effects of another medical condition. Signs of addiction to marijuana may be subtle, but they can pervade every aspect of the person’s life. For example, marijuana abuse has been linked to reduced motivation. People who use this drug every day or multiple times per day may stop going to class, work, or social functions. Increased depression,aggression, or suicidal thoughts can be triggered by chronic marijuana use. Though withdrawal from marijuana after regular use involves mostly psychological symptoms, it can still be a tough experience. Professional help is often required since at-home detox attempts may result in relapse. Complications are more likely when a person abuses other substances in addition to marijuana, or when a person suffering from co-occurring mental health issues. Disorientation, hallucinations, and paranoia can all lead a person to self-harm, either by accident or on purpose. For people who have physical issues like asthma or heart conditions, marijuana overdose can put them at risk of serious health complications, due to changes in respiration and heart rate. Misinformation about marijuana can lead people to believe this substance is not dangerous or addictive, but it is a powerful drug, and it can become habit-forming or part of a compulsive use disorder.